At Advanced Office, our top priority is to provide Orange County businesses with the best printer or copier for their needs and budget. 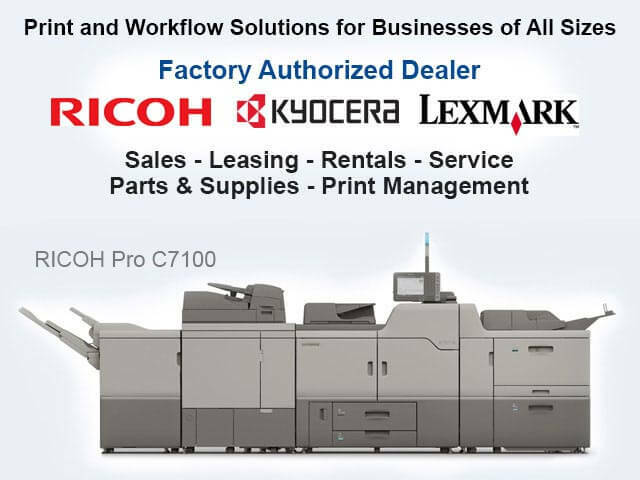 We offer cost-effective sales, leasing, and rental options for Ricoh and Lexmark's exceptional lines of high-performance commercial products, including multifunction copiers, printers, production printers, wide-format printers, digital duplicators, and fax machines. 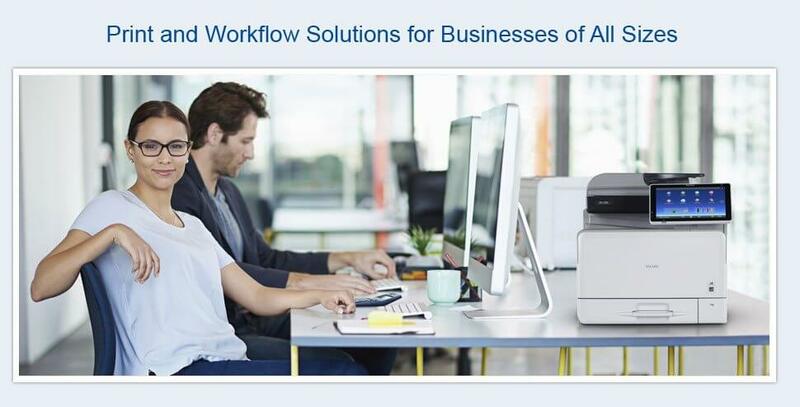 For Orange County customers looking to get the most out of their office automation equipment, we also offer custom workflow and software solutions as well as all-inclusive service and supply agreements. By providing our value-added services, superior customer service, expert advice, and competitive pricing, we have accrued more than 30,000 satisfied clients throughout Southern California over the last 30 years. Orange County businesses come to Advanced Office because we offer everything they need from a copier dealer and more. To begin with, we provide every client with a comprehensive analysis of their internal workflow (including interviews with key users, a review of your current office equipment, and a determination of how paper moves through your office). This analysis lets us understand your document management needs and budget limitations. We then design a custom print and workflow solution that is aimed at making your Orange County office more productive and cost-efficient. Our team consists of over 75 copier and printer experts that average nearly 15 years of experience. They are thoroughly trained by Ricoh and Lexmark and extremely focused on customer satisfaction. 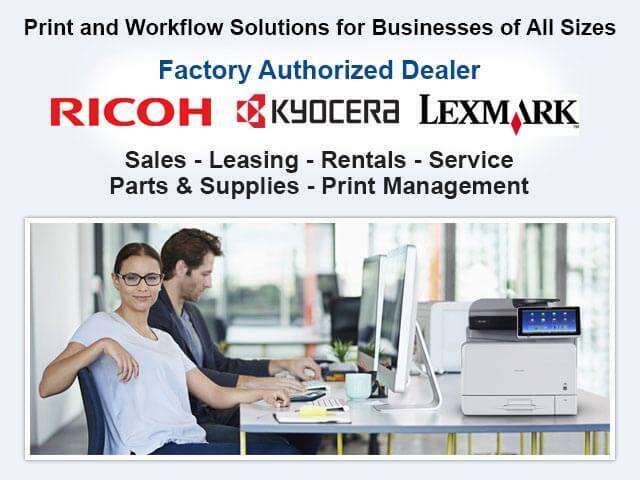 We exclusively sell, lease, and rent Ricoh and Lexmark office equipment. Ricoh and Lexmark are both industry leaders in printer and copier design, engineering, and production and have both won awards for innovation, quality, and eco-friendly practices. Additionally, we carry more than $1 million in OEM parts at our local Orange County warehouse so that our clients can rest assured that we have the right parts and supplies readily on hand for fast and effective service. There's no other copier dealer serving the Orange County area that is as focused on quality of service as we are. We prioritize personal interaction, responsiveness, reliability, and first-call effectiveness. With exceptional product lines, highly customized service, and great rates, Advanced Office offers Orange County the best value in professional copier and printer products and services. Plus, due to our size and dealer level, we are able to provide our clients with some of the best prices possible for Ricoh and Lexmark copiers and printers. Call today for your free onsite analysis. We'll help your Orange County business determine which office equipment will best serve your needs, save you money, and boost your productivity. For the last three decades, Advanced Office has provided Orange County businesses with the best value in copier sales, leasing, and rentals. By offering great rates and flexible financing options, we make it possible for businesses of any size to afford a Ricoh or Lexmark copier. Orange County offices prefer Ricoh and Lexmark over other brands because they are highly reliable, fully customizable, fast, intuitive, and eco-friendly. Our copiers are equipped to copy, print, scan, and fax, and can also perform a variety of finishing functions, such as collating, folding, ring binding, hole punching, and stapling. They can also be customized with document management software. Call Advanced Office today to discuss your copier needs and receive a free workflow analysis with one of our consultants. Our consultants are all highly trained in all Ricoh and Lexmark products and average about 15 years of industry experience. 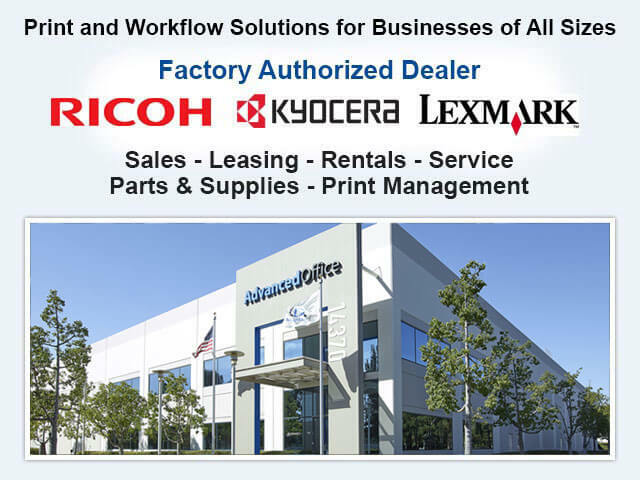 Advanced Office sells, leases, rents, and services Ricoh and Lexmark printers. Orange County commercial clients have been coming to us for over 30 years because we offer the finest line of printers, a wide range of payment options, and world-class service. By investing in a Ricoh or Lexmark printer, you'll benefit from reduced printing costs, faster printing speeds, and greater reliability. 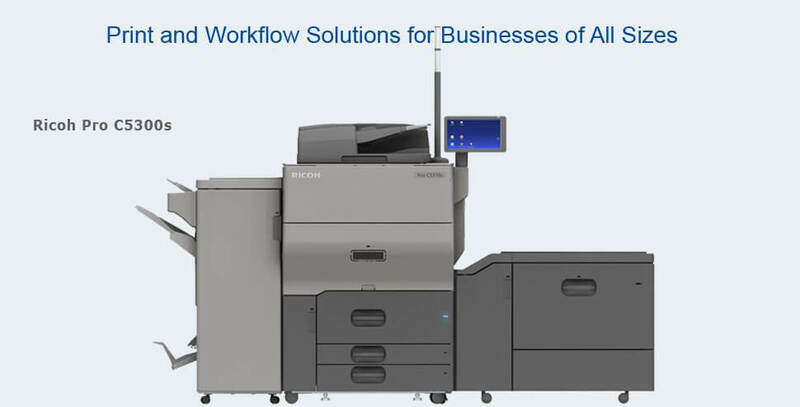 Additionally, we can back your Ricoh or Lexmark printer with cost-effective, all-inclusive service and supply agreements, in order to further ensure your office maintains a high level of productivity. Ricoh and Lexmark printers print in color, black and white, or both, and can come with a wide variety of features, such as duplexing, high-capacity paper trays, specialized software, and more. Call today to speak with one of our printer experts about the best brand and model for your needs in Orange County. Advanced Office is Orange County's trusted source for Ricoh wide-format printers. We sell, lease, install and service wide-format printers that give businesses the capacity to produce astoundingly high-quality, oversized prints in-house. Wide-format printers are ideal for engineers, builders, contractors, architects, and other businesses in Orange County that frequently need to print documents that are much wider or longer than your standard paper sizes. We are proud to offer Ricoh's wide-format printers because they are renowned for producing large prints with excellent resolution, quickly and cost-effectively. They can also copy and scan wide-format documents. Call today to learn more--our consultants are incredibly familiar with Ricoh's wide-format printers and can determine which models and custom features will best suit your needs and budget. Advanced Office is an expert in helping Orange County businesses determine the best production printer for their needs. As an authorized Ricoh dealer with more than 30 years of experience, we specialize in offering Ricoh's full line of production printers, including those made by related brands Savin, Gestetner, and Lanier. These printers are known for producing large quantities of high-resolution prints quickly and affordably. All Ricoh production printers feature ultra-durable components and a number of finishing options, such as high-volume hole punching, saddle stitching, stapling, collating, trimming, folding, ring binding, and more. For the right Orange County business, production printers can save both time and money. To learn more about these state-of-the-art products, call and speak with one of our sales consultants today. 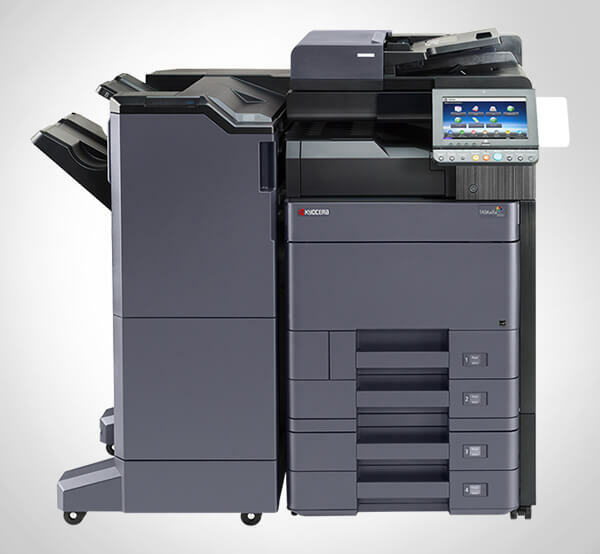 At Advanced Office, we sell, lease, install, service and maintain Ricoh digital duplicators at very competitive prices. Digital duplicators are a perfect print solution for Orange County schools, hospitals, nonprofits, universities and commercial businesses that frequently produce high volumes of single page prints, such as flyers, forms, and other black and white or one color documents. These fast, highly durable machines withstand heavy use and are extremely cost-effective. Give us a call today and learn more about the benefits of our digital duplicators as well as our financing and service contract options. For Orange County businesses on a budget, Advanced Office is the best source of refurbished Ricoh and Lexmark copiers and printers. Our refurbished stock consists of equipment that has come right off of our short-term leases and shows little to no wear and tear. We then install new toners and replace heavily used componentry with all-new parts. Additionally, all refurbished printers and copiers must pass a comprehensive 60-point inspection before we certify them for resale. To learn about our current refurbished inventory and discuss financing options, call today. In this day and age it is so reassuring to know there are vendors such as Advanced who are always looking out for their customers and doing right by them."